We offer four different types of shares: vegetables, eggs, frozen broiler chickens and soap. Vegetables are available as summer shares (June through mid-October) and fall shares (mid-October through November). Summer fruit add-on shares, procured from other local farms, are delivered for 10 weeks during the summer vegetables season. Eggs and soap are available in 26 week/6 month shares: summer (June through November) and winter (December through May). Chicken shares are available any time! Community-Supported Agriculture (CSA) is a unique partnership between farmers and people who want to purchase fresh, healthy, chemical-free food, support local farmers, and support the local economy. 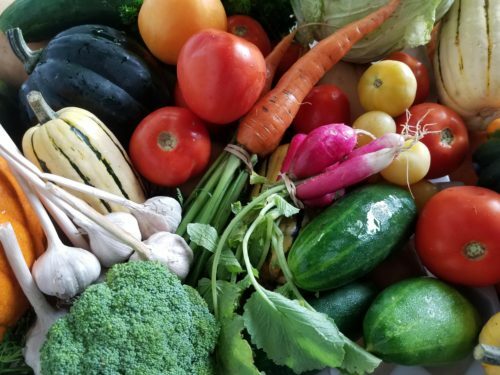 • Investment: When you purchase our CSA shares ahead of the growing season, you literally provide “seed money” that we can use for seeds, equipment, repairs, etc. – the necessary things we need in order to raise crops and animals. 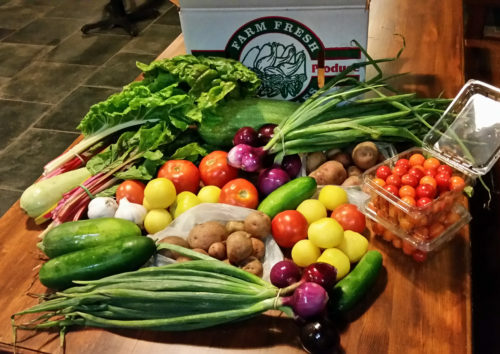 • Rewards: Your CSA membership is an investment in the Farms, and you share the risks and rewards of farming with us. In return, we share the season’s harvest with you! • Impact: By supporting Raccoon Forks Farms, you participate in good land stewardship, erosion-prevention, and humane treatment of farm animals. Select the CSA share types and sizes you wish, and decide where you’d like to pick them up. (We deliver to nine locations in Des Moines, West Des Moines, Urbandale, Ames, Adel, and Perry.) We’ll deliver your shares to that location and you can pick them up between 3-6 p.m. the day they’re delivered. Vegetables will be in produce boxes. Eggs and frozen chickens will be delivered in coolers. Each of your shares will have your name on it! What size share should you get? Our vegetables shares run for 20 weeks in the summer and 6 weeks in the fall. Both summer and fall vegetables shares are available as full and half shares. Which size should you get? Traditionally, a half share is recommended for 1-2 people and a full share is recommended for 3-4 people. We think those are good general guidelines, but it also depends on how much produce you like! Eggs shares run for 26 weeks and are available as full shares (one dozen eggs per week) and half shares (half-dozen eggs per week). Soap shares are delivered monthly for six months. They are available as full shares (four bars of soap per month) and half shares (two bars per month), with a monthly rotation of two different scents. We also offer a monthly sampler share – six mini-bars, one of each scent, in a half dozen-sized egg carton! Frozen broiler chickens – the number of chickens per share varies depending on their sizes, but each share will total 15+ pounds of chicken. You can order chickens any time and receive them in individual or batch deliveries, upon request. Just let us know by Monday of the week you’d like to receive one or more of your birds, and we’ll bring them to your pick-up site that week. 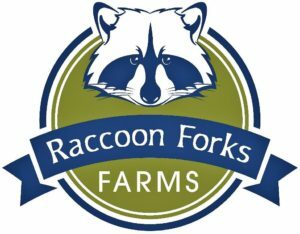 Why choose Raccoon Forks Farms? We provide employment opportunities to people with cognitive disabilities and mental illness. These employees fill valued roles in our operations and receive one-on-one job coaching and the support they need to build skills and be successful on the job. We take pride in farming sustainably! We don’t use chemicals or hormones. Instead, we use crop rotation, cover crops, as little tilling as possible, and our own compost to grow our produce and improve the health and fertility of our soil. Our animals are cage-free and pastured – we believe sunshine, grass beneath their feet, and the ability to forage keep our animals happy and healthy. In return, they give us rich, delicious brown eggs and wonderful meat! We thank you in advance for paying in advance! Your investment is a huge help to us in planning and preparing for the farming season to come. You are welcome to pay by credit card (we’ll email you a PayPal invoice) or by mailing us a check. Please contact us at (515) 729-8664 or rforksfarm@gmail.com.